The draw rate is 56/84 (67%). Stockfish had a wonderful round, 4 wins, first win with black and it now leads the table with a 1 point margin. The most notable win was against Komodo, first decisive game between these legendary rivals this season. Komodo's round was below average for it with one win and one loss, it is now only third behind Houdini. Stockfish had an eval advantage from the opening against Jonny, and it gradually increased as the game continued. First Stockfish created a passer, this was then converted into a pawn advantage, and finally two pawns advantage in a QB vs QB ending. Komodo had a knight for pawns imbalance against Fire but there were not enough pieces on the board to get anything more than a draw. Jonny had a pawn advantage in a RRB vs RRB position against Gull. It took a while for Jonny to find the best way to continue. It gave the pawn back to gain a passer, Gull then gave a rook for a bishop to get rid of the passer. The RR vs RB ending was slow, with all pawns on the king side it looked difficult, but Jonny managed to convert a win. Houdini had an eval advantage from the opening against Andscacs, but evals did not change a lot for 30 moves. Houdini then improved its position, winning a pawn in a RN vs RB ending. Andscacs could not hold and Houdini won another pawn for the win. Houdini still only 0.5 behind the leaders. Komodo equalized very quickly playing black against Andscacs, and then Komodo's evals started to increase. Material was equal and the most visible weakness for white was a more exposed king, but still evals were at 1 and increasing. A few moves later Komodo won a pawn, and after several exchanges Komodo was two pawns up in a QB vs QN ending, enough for a comfortable win. Gull was close to a win against Rybka, the game reached a BB vs BN ending in a closed position with evals over 2 for Gull. Apparently Gull blundered in the end and allowed Rybka to close the pawn line, block the white king from approaching and force the draw. Gull is still the only engine with no wins in the stage. Fire - Jonny: Jonny sacrifices a knight for three pawns, and when the center opened up it turned out that the extra piece was more important. Fire traded a bishop for a rook and then excanged pieces to get a winning RB vs R ending. In a rare situation Komodo was a pawn down against Jonny and evals favoring black. However after exchanging pieces the game reached a drawn rook ending. Andscacs started with an eval advantage against Stockfish, but it was not careful enough allowing Stockfish to have connected passers in the center. Andscacs was not able to stop the advancing pawns, supported by all the white pieces. When Stockfish started to win material the game was over. The first win in black for Stockfish. Houdini had an eval advantage against Jonny, and after several pawns were exchanged evals climbed above 1. Houdini's bishop pair was strong in the open position, together with the queen they effectively targeted the black pieces. Houdini was able to capture a rook for a bishop and that was enough for a win. Stockfish - Gull was in a closed position for a long time. Stockfish won a pawn in a series of exchanges and the game reached a rook ending. The white king was able to penetrate and assist the white passer, causing black's position to collapse. Three wins in a row for Stockfish. Rybka was a pawn up early in the game against Houdini, but Houdini compensated with a strong king side attack. Rybka sacrificed a knight to try to relieve the pressure but its king was too exposed and its pieces vulnerable to attacks. Houdini won the game easily. What a battle this was! 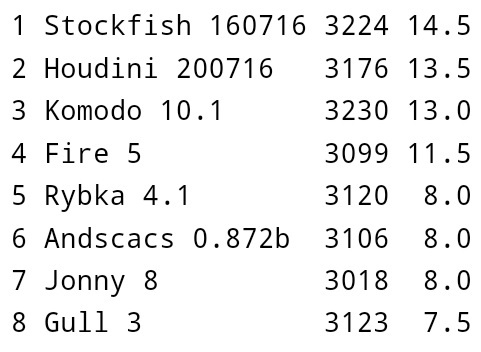 Stockfish was a pawn up very early and had an eval of around 0.8. Komodo's eval was close to 0 and for a long time there was no apparent purpose to Stockfish's moves and the evals remained steady. Stockfish gave up a pawn and opened up the center, the evals started to slowly increase. The advantage was starting to show as Stockfish had two connected passers on the queen side. Can Komodo hold? As the endgame approached Stockfish regained the pawn and won another. With passers on both sides Komodo's defense became impossible. When the pawns started marching the game was over. A huge result for Stockfish.